My lovely mum is going through a difficult time at the moment. And as you’ll know, it’s really hard to see someone you love upset. So as well as keeping her in a constant supply of heartfelt hugs, I bought her this bunch of bright cheery flowers to lift her spirits a little and to remind her how much she is loved and treasured. Today I went into the city to go to my first hair appointment in, well, quite a few months. And I thought it’d be a great opportunity to sprinkle some more kindness around my city. 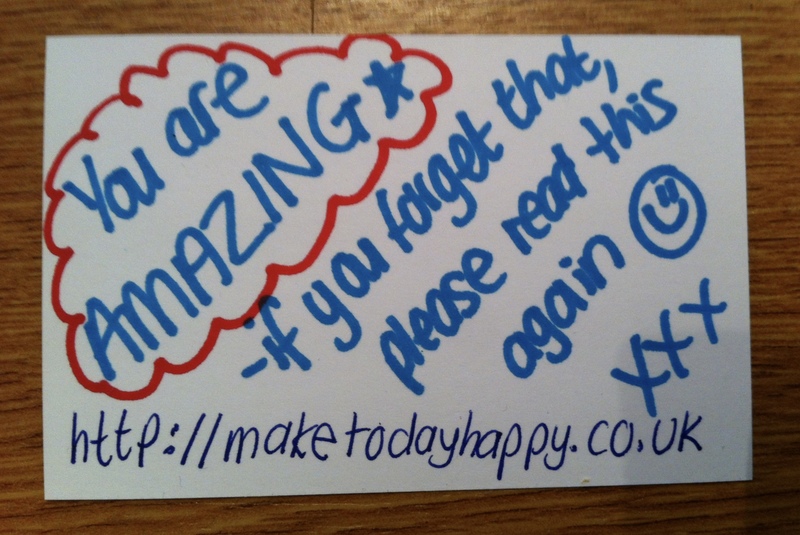 I wrote my new favourite kindness message on seven of my Kindness Cards: “You are AMAZING. If you forget that, please read this again” and set off to get my bus. I’d planned to stick my messages onto lampposts around the city centre, but as lots of rain had been forecast, I knew they’d get wet and ruined very quickly. So I decided to bring my kindness act inside. Kindness Card #1, I left on the seat of my bus, hoping to make the next passenger who sat there smile. 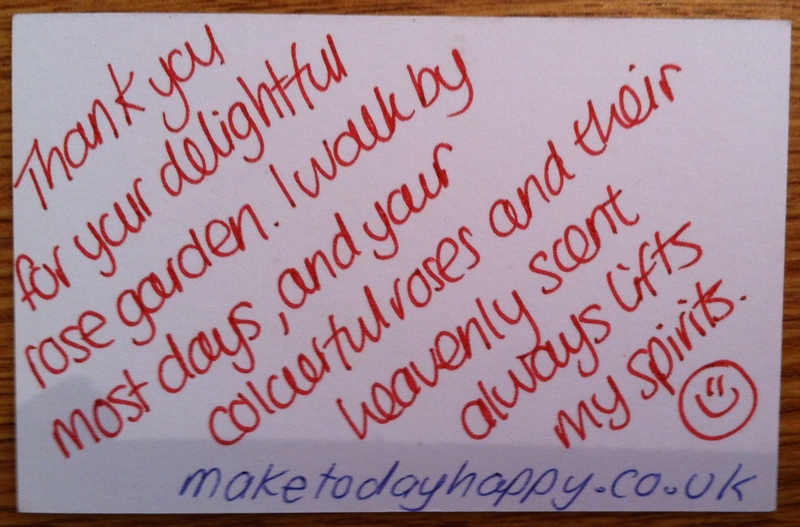 Kindness Card #2, I left on a bench inside the shopping centre, so the next tired shopper needing a rest would find it. Kindness Card #3, I stuck on the bathroom mirror of the shopping centre, so shoppers can read it while washing their hands. 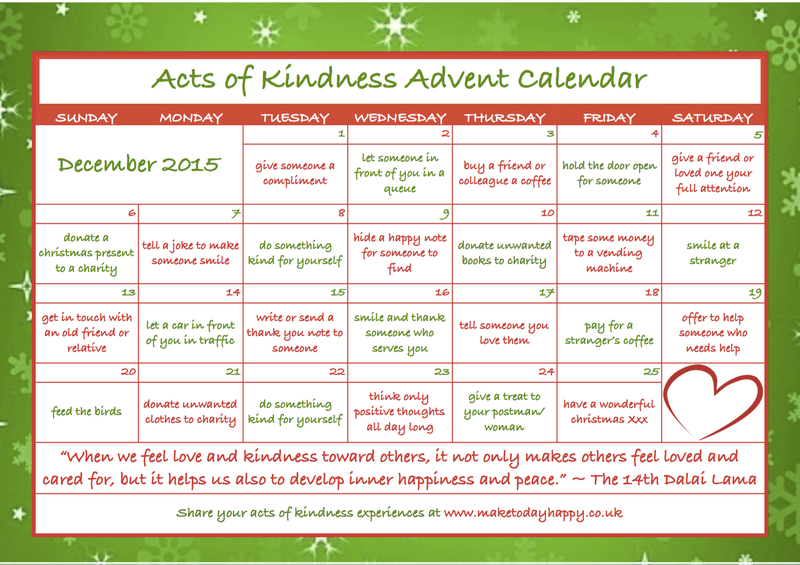 Kindness Card #4, I stuck on a pillar inside the shopping centre so busy shoppers will notice it as they pass by. Kindness Card #5, I hid in the condiments tray on the café table where I had a bite to eat, so the next diner would get more than bargained for when reaching for the salt! Kindness Card #6, I stuck on the cafe’s bathroom mirror, to make diners smile as they washed their hands. Kindness Card #7, I sneakily stuck on the mirror while I was having my hair done, without my lovely friend and hairdresser noticing (Gotcha lovely Mel, tee hee!). I hope it made everyone who saw one of my kindness cards, feel AMAZING. And if you’re one of the folk who’ve come across one of my messages today, I’d love to hear from you in the comments below! So with this in mind, my happy for today is being kind by leaving more kindness messages around my city.